At CVS Health, we are acting vigilantly to help our clients contain costs while supporting plan members with affordable, clinically appropriate prescription drug benefits. This week we announced our 2017 formulary strategy, which is estimated to generate more than $2.7 billion in savings and require fewer than 1.5 percent of members to change therapy.1 Client feedback has been very positive. Now we have more reason to be proud – even the news coverage is a recognition of our approach. Various news outlets called our strategy “audacious” and “aggressive.” And we were both of those things because we believe that it is our job to take a stand on behalf of our clients. In today’s dynamic market, a key to containing cost is the formulary. We have long been a market leader in how we approach formulary strategy and in coming up with innovative solutions. 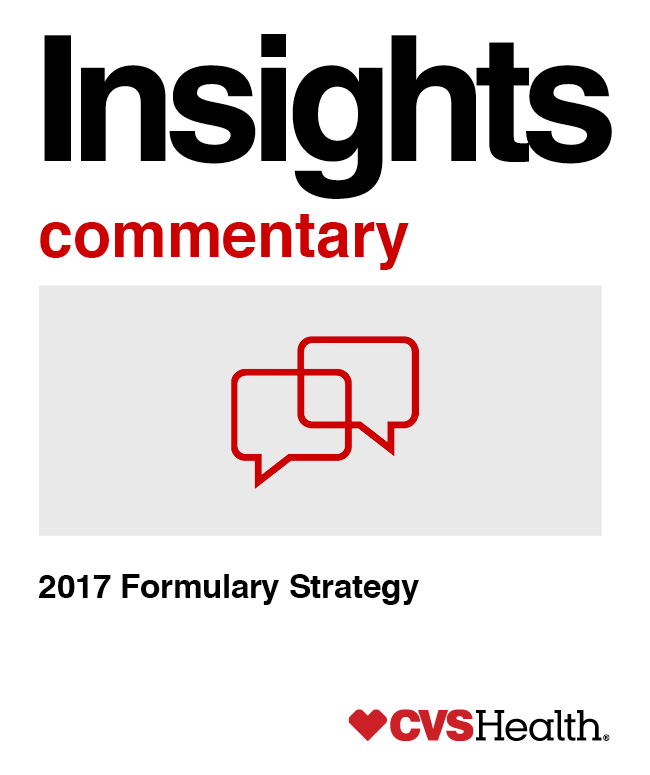 Our 2017 formulary management strategy continues to address emerging cost drivers with new, market-leading enhancements. While non-specialty brands continue to be the biggest driver of trend, specialty drugs are having ever greater impact on client plan costs. That’s why, as highlighted in our 2017 formulary strategy announcement, we are leading the market in endorsing the use of biosimilars and working to encourage patient and provider adoption of these cost-saving drugs. Biosimilars and follow-on biologics will be included as a key component of our 2017 standard formulary strategy. Although only two biosimilars have been approved in the U.S. so far, we expect more will come to market in the coming years and anticipate significant savings for many clients and members, as higher cost products are replaced with lower cost biosimilars. This model has already been successfully adopted in the European market and helped reduce costs for payors while helping ensure patient safety and access. Our 2017 formulary strategy announcement also introduced our new indication-based approach. Indication-based formulary is a more precise management strategy related to a drug’s treatment indication and the value that therapy delivers to each individual patient. Given the growing number of supplemental indications for many drugs, utilizing a more targeted, indication-based formulary helps expand our negotiating strength to help improve formulary positioning and rebates for products, creating opportunities for more value in the form of client and member savings. Escalating drug prices and costly new therapies pose a significant challenge to the affordability of health care. When considering which drugs to include in our formulary and which ones to remove, we focused on making sure that members have affordable access to clinically appropriate drugs while helping reduce costs for our clients. Another area of prescription drug costs that has drawn a lot of attention lately, and one that we are focused on, is hyperinflationary drugs. As Troy Brennan, MD, chief medical officer, pointed out, some drug companies are resorting to hyperinflation – or drastic price increases – as a way to drive greater profits. And although so far the impact of these drugs has been relatively limited – less than 1 percent of client trend – they have significant potential to have a much larger impact in the future. We are monitoring for unexpected price hikes on an ongoing, real-time basis, enabling rapid response to help reduce impact on our clients’ spend. On a quarterly basis, products with egregious cost inflation that have readily available, clinically appropriate and more cost-effective alternatives may be evaluated and potentially removed from the formulary. Our focus will be on targeting products that have experienced high inflation, offer no clinical differentiation and/or provide no significant contractual value back to plan sponsors. At CVS Health, we are acting vigilantly to help our clients contain their costs while supporting their members with affordable prescription drug benefits. A key to containing cost is effective formulary management. This is essential at a time when escalating drug prices as well as the introduction of new costly therapies are creating significant challenges to the affordability of health care for all Americans. 1. Projections based on CVS Health data. Individual results will vary based on plan design, formulary status, demographic characteristics and other factors. Client-specific modeling available upon request.